Okay guys, I promise that this will be my last post about my foyer. Most of the time I do any before and after post it is to document any progress or projects I have done. Also, please forgive the before pictures…they were taken on a good camera by an amateur last fall. Yeah, I am really bad at taking before pics, but hey this is really what my foyer looked like (maybe a little staged) before the whole Fornasetti wallpaper and plus this is NOT an area in my rental that gets changed constantly. The foyer before the makeover was decent…in fact, I like it. It was just not functional for a family of 5 and it was a little to sweet when you looked at my rental as a whole. 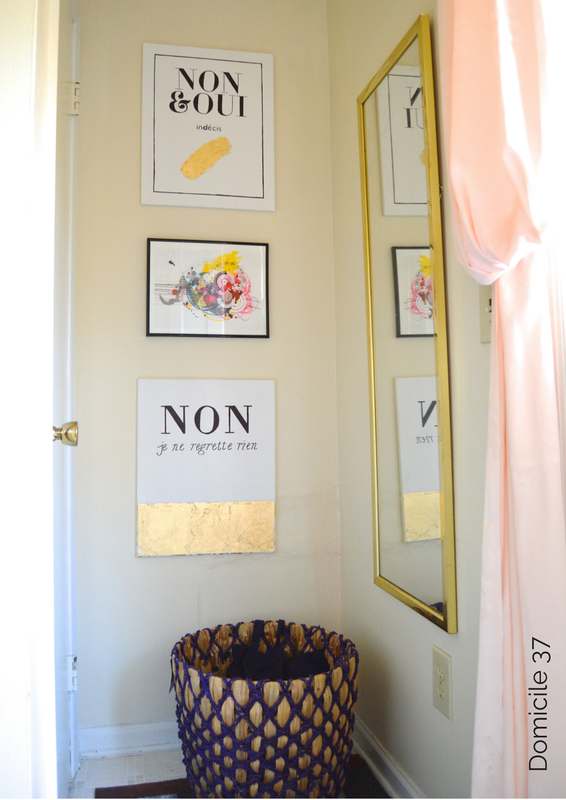 The NON-art was a copy cat DIY project, any other art pictured was thrifted. The basket is from target, the chalkboard was DIYed, and and the curtains were homemade…please do not ask. I liked the look of the curtains when I first hung them up but since the foyer is very narrow it ALWAYS made the foyer look crowded. I still have this rug, but it is now in storage and this rug alone brings in the most comments by guest…everyone always ask me, “where did I buy this rug from?”….Surprise, surprise…I made it. I think at the time I painted this rug…I had to have been in the middle of a design disaster. My house was suffering from a design dilemma. 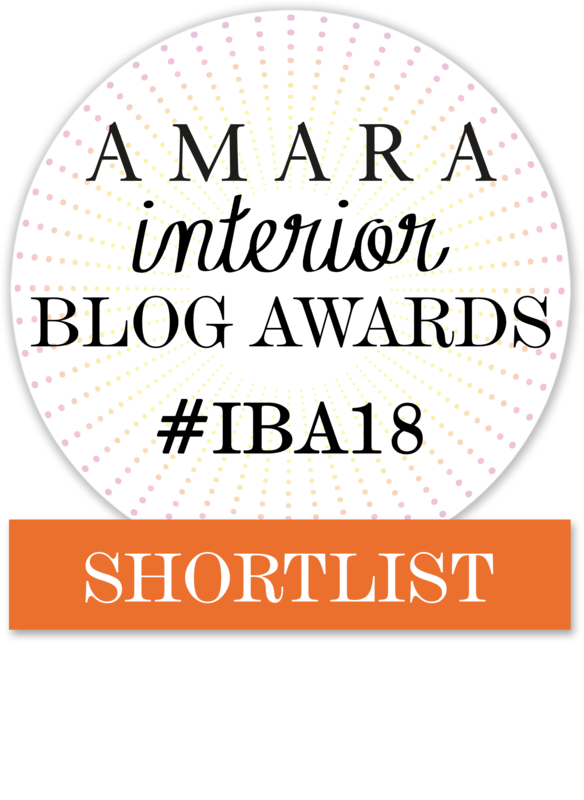 I also was on a blog hiatus at this time…I really do know why, but I was. Anyways, although this rug does not fit the style of my home now…I just cannot seem to part with it. The after…is more up my alley. 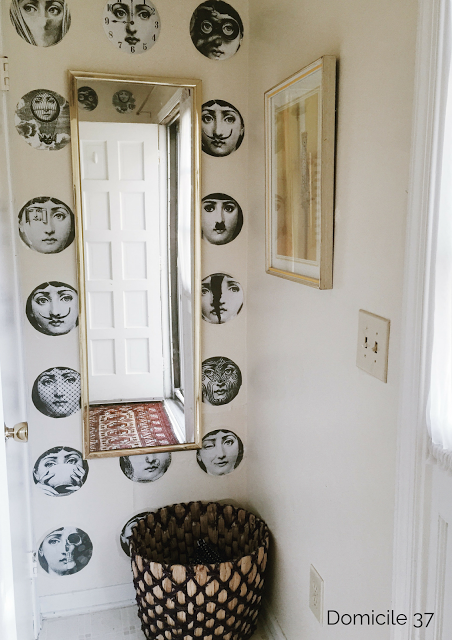 I was inspired by the art of Fornasetti and decided to make a statement by creating a faux Fornasetti wallpaper. 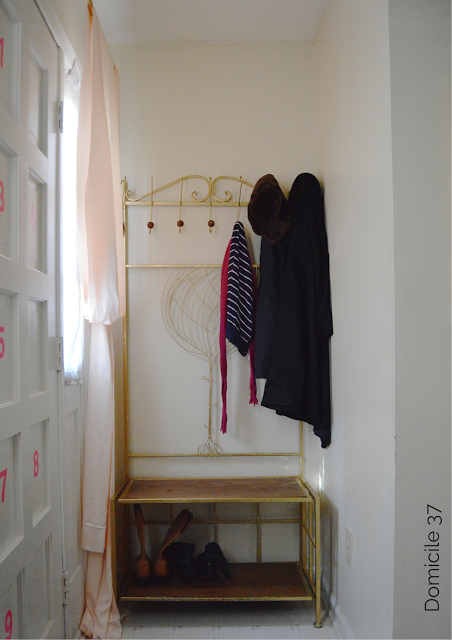 The console table in the foyer actually serves the purpose of a DIY Shoe Rack. 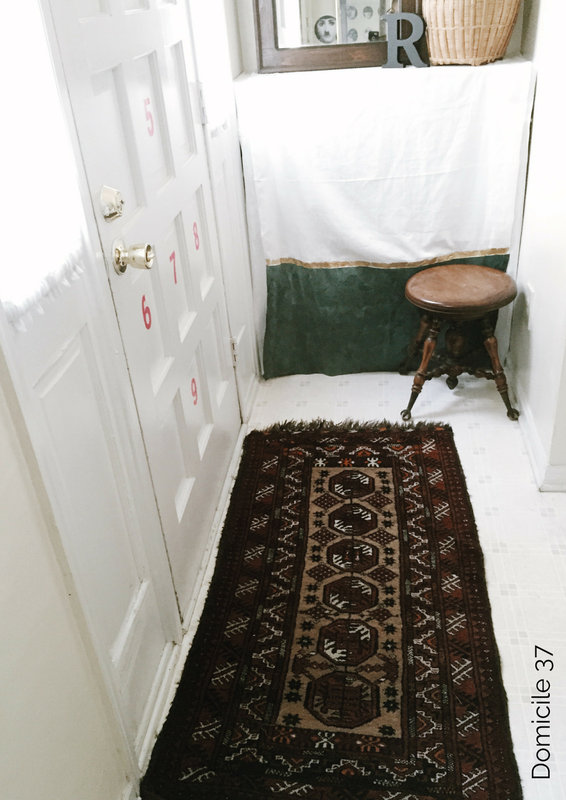 The cloth on the shoe rack was also homemade and the persian rug was a thrift store find. Well actually everything but the letter “R”, the basket, and the actual plant were all thrift store gold scores. Wow I love both before and after! Looks great. Looks fantastic! I love love the circle art work again!! Oh wow! What a transformation! I LOVE the photos! I love the new look! I really love that you kept that basket.. it's awesome! It can be challenging but also a lot of fun to stay on a budget. You did a fantastic job! Thanks…I am always on a budget…it is a challenge, but that is what makes it fun! It looks great! Everything just tues together so well! I loved the before and after! I love love love both! Seriously everything is so nice I need to go up my foyer game. I love both looks! Beautiful! they both look great! and yes, i do love that first rug! lol. you have a great sense of home decor style. Impressive–I'd be super happy even if your "before" was my "after"! Gorgeous! Thanks Jamie! That was such a sweet comment! Beautiful space and seems to really show your personality well. 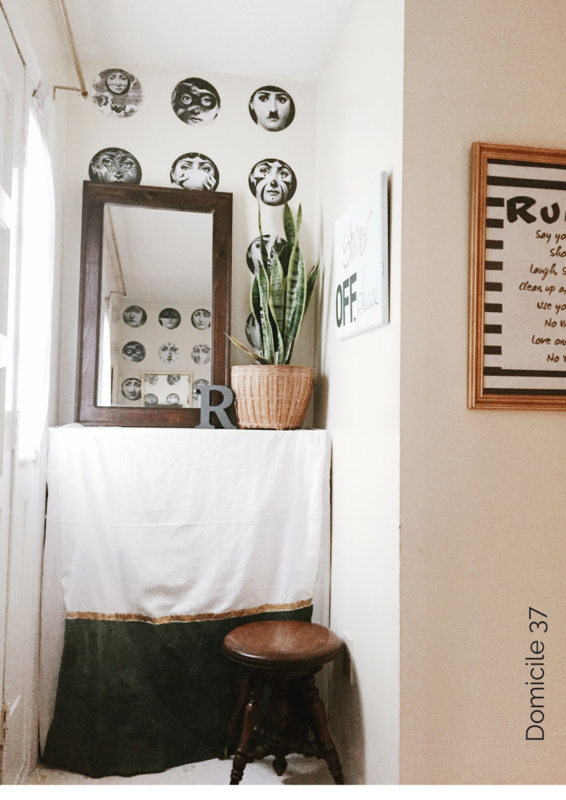 I'm thinking of redoing my foyer soon! Thanks for sharing! Thank you Ashleigh! When you redo your foyer, I hope you share it with all of us! I love both the before and the after. I also love that it cost you less than $50. Great job!! I'm in love with that new rug, great pick! Thanks! Thrift Store Hot Score! Thanks Jeanine! The foyer can be a hard room to makeover because it is not a space we actually hang in and if you have kids, it may clutter easily, but it is also the first space guest see when they walk in. good luck and when you do make it over, I hope you share it with us. You are so sweet and right on point! Thanks Julie! Oh, I love it! The foyer is one of the areas I really need to work on, but i just can't bring myself to do it when the bathroom, kitchen, and living rooms need it too! Ha! What are the numbers on the back of your door? Thanks love! I am still waiting on your home tour….I love what you have done so far and I cannot wait to see more. The numbers on the back of my door have been there for 2 years. They are vinyl and originally placed there to keep my little ones busy as they wait by the door when it is time to leave. Til this day those numbers still occupy them. Awesome! I love that rug. Super cool space! How fun is this! Super great space! I think both of the before and after are way cute! That rug is good inspiration… I want to paint a big one! Thanks! You should definitely try to paint your own rug…you can make your own pattern and personalize it to you liking. it will be cool! Very unique! This came out too cute…Thanks for sharing…. I definitely love budgeting. Sometimes you never know what you have in your home that can transform another area. Thanks! 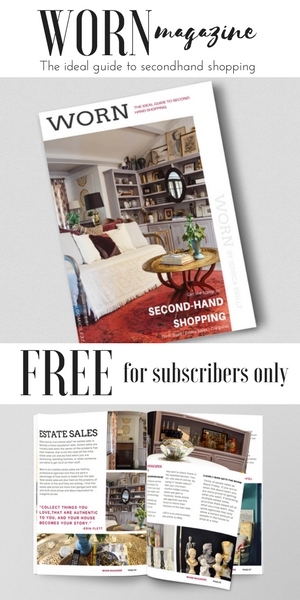 shopping my home is my favorite, and you are right…"you never know what you have"
ha! you are too sweet brooke! 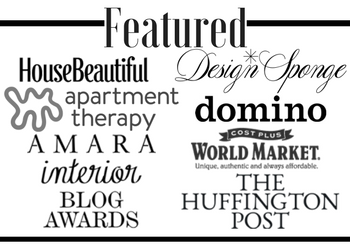 Yes, it is CRAZY how design styles evolve….Mine evolve on the daily. haha! I think you have a great design style, it is cute and fun! Love it! It's nice to change things up now and then. I think both before and after look fantastic! It's amazing how much you changed the look with just a few simple alterations! It sure is, thanks for stopping by! Great job. You really transformed the whole foyer. Love it! thanks! living on a budget can be challenging, but that is what makes it fun! Oh, I love it! Turned out great and for such a reasonable price! I love them both! It came together! Good Job! 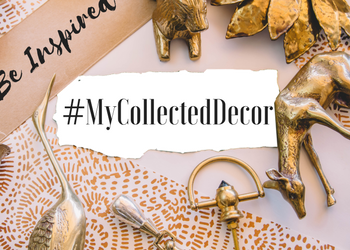 I love affordable makeovers and I love what you've done with your space! It definitely looks more personalized now. Great job! What's the old saying "necessity is the mother of invention"? Your budget makes you so creative. I love the picture circles! Thank you Traci! You are so sweet! Love the quote! Looks great! I love the Fornesetti!! What a fun makeover! It turned out great and I love that you were able to do it without spending a fortune! It's so fun to change things up every once in a while! Great job! Oooo! 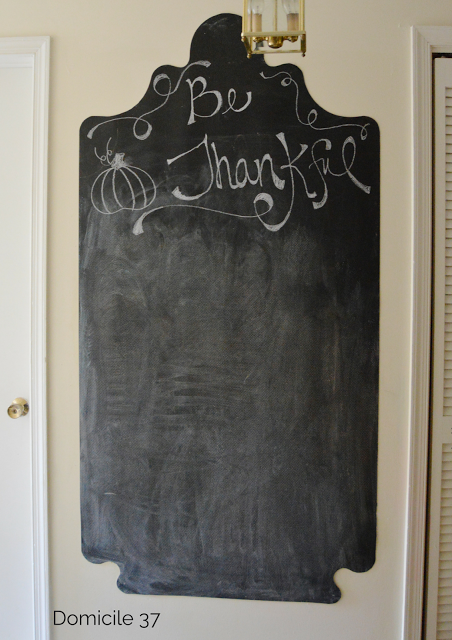 So excited to see about that rental friendly chalkboard. One day I won't be renting anymore! 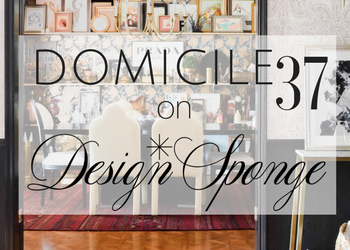 GOODNESS all of your spaces are SO chic and eclectic! I need your special touch for our living room! Thanks Girl, you are soon sweet! What a fun project! 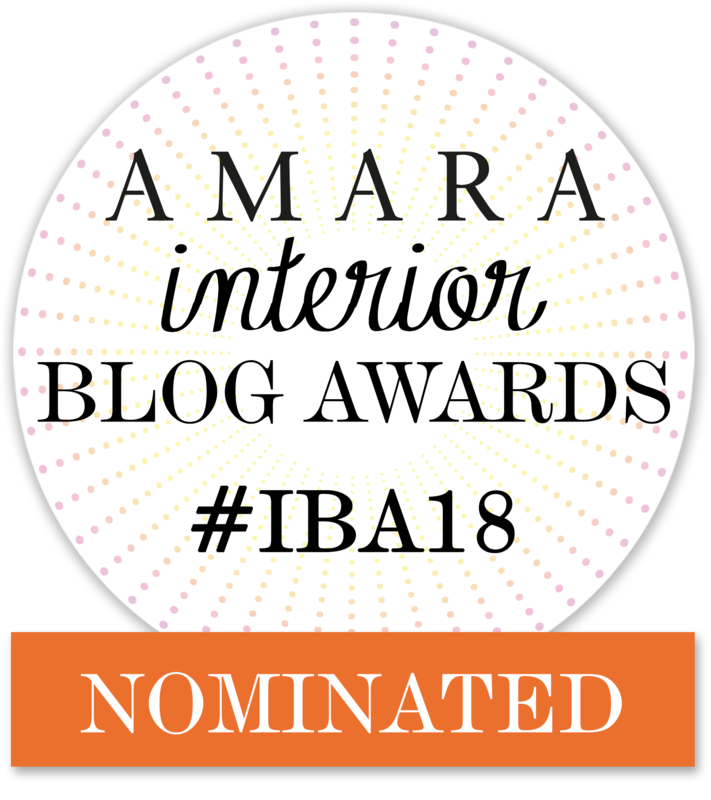 I have a lot of redecorating to do…your blog might be the inspiration I need! Glad to have found you! Awww, Thank you! I am so happy I can inspire you! 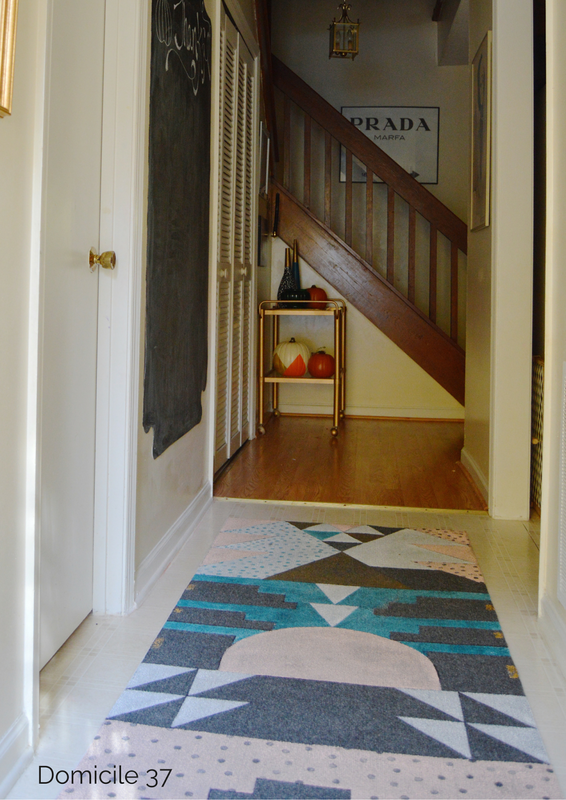 Your foyer came out great! I am a fan of the before foyer and the after redecorating! Both look nice. 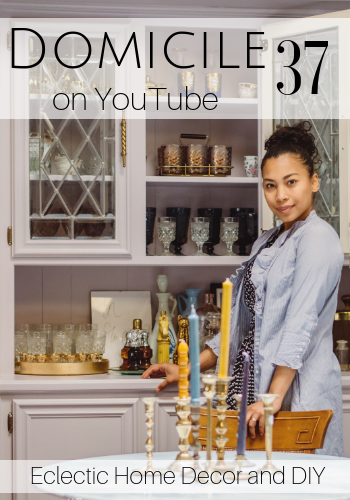 We live in a small apartment and you really do have to get creative with décor and storage solutions in a small space! You said it girl…when you rent, you NEED to have some sort of imagination and creativity to make it your own. The struggle is real! 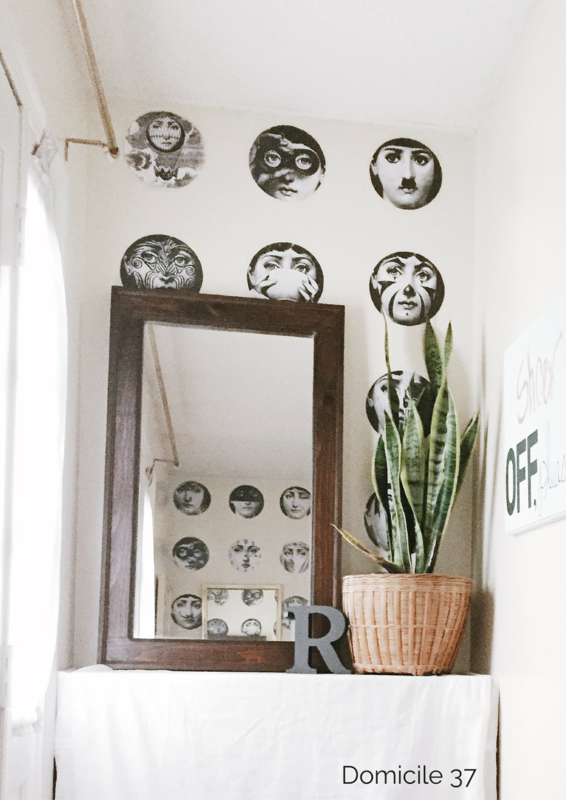 Love the eclectic space and the surrealism feel with the 1920's faces and the mirror! Great job. Wow! Very creative. You were able to do a lot on a small budget! Dying over here! I love the white with gold accents. My dream! Awesome job! I like the artwork.